The magician shows a casino cut card. 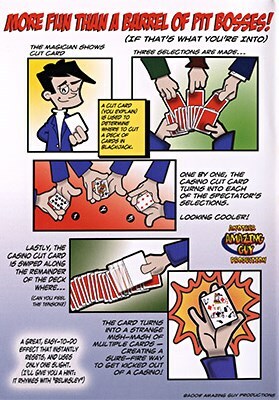 A cut card (he explains) is used to determine where to cut a deck of cards in a game of Blackjack. Three selections are made by three different participant and one-by-one, the casino cut card turns into each of the spectators' selections. 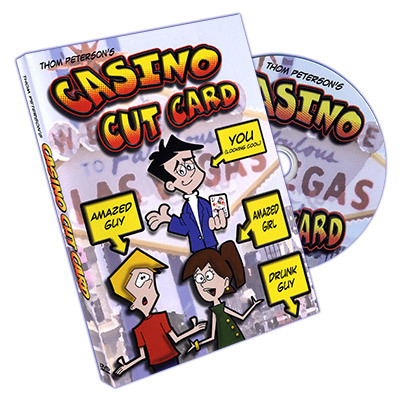 Finally, the casino cut card is swiped along the remainder of the deck and the card turns into a strange mish-mash of multiple cards - creating a sure-fire way to get kicked out of a casino! A great, easy-to-do effect that instantly resets, and uses only one sleight.